Zac Cohen prepares a technical evacuation route as the Summit County Rescue Group works to save two stranded hikers on Quandary Peak on Friday. 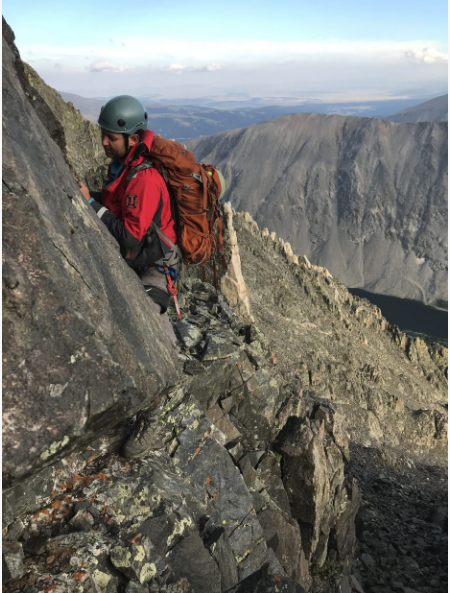 The Summit County Rescue Group saved two stranded hikers on Quandary Peak with an effort that took more than 13 hours, starting Friday afternoon and continuing into early Saturday morning. The rescue team was notified of two hikers stuck on a cliff at 13,800 feet elevation at 2:18 p.m. Friday, according to the group. Quandary Peak was the third-most hiked 14er — mountains with peaks above 14,000 feet — in the state in 2017 with an estimated 21,000 hiker use days, according to the Colorado Fourteeners Initiative, and attracts many novices. A 26-year-old woman and 31-year-old man, both from Texas, were reportedly planning on hiking Quandary Peak’s most traveled route, the East Ridge Trail, on Friday when they ran into problems. Unfamiliar with the area, the pair drove to the end of Blue Lakes Road where they got on the trail that leads to the much more technical West Ridge, not the East Ridge, according to the rescue group. The two started their hike at about 7 a.m. and had a rough idea of how long the trip should take. They were underprepared for deteriorating weather conditions, however. As they ascended the ridgeline, dropping temperatures and snowfall led them to reassess their plans. About 800 vertical feet shy of the 14,265-foot Quandary Peak summit, they decided to retreat down the mountain. During the descent, snowfall caused the hikers to drift off path and they got stuck in a series of cliff bands. The first technical response team, tasked with hiking up the West Ridge, was unable to quickly find the pair. With daylight fading and a potential for increasingly poor weather, a Flight For Life helicopter was requested for a reconnaissance flight. The helicopter found the hikers at 4:47 p.m.
As a precaution, Flight For Life took another rescue team of two climbers and associated climbing gear to the saddle on Quandary Peak’s East Ridge at about the 13,000-foot level. The rescuers proceeded to the summit and then started down the West Ridge, intercepting the ascending West Ridge team at around 7 p.m. before finding the stranded hikers only five minutes later. Rescuers worked their way down to the hikers and set hand lines for their climb back up and eventual hike out. After contacting the party, the rescuers saw the two hikers were showing signs they were in the initial stages of hypothermia. At that point, the priority became warming the pair for the hike out before actually getting them off the cliff and back on the trail. At this time, another snowstorm complicated matters as it moved through the area — along with thunder, lightning and wind. The weather heightened the challenges the rescuers faced, especially considering they were on an exposed ridgeline. The stranded party was not back on the West Ridge Trail until 9:40 p.m., at which point the rescue teams and hikers started down the ridge. All were off the mountain by 2:15 a.m. Saturday morning. In total, 18 members from the Summit County Rescue Group responded to the call. The rescues comes after a 67-year-old hiker died last week when he suffered a heart attack about a half-mile up Quandary Peak. The Summit County Rescue Group reported the man, who has been identified as 67-year-old David Law of Casper, Wyoming, was with a group of friends intending to summit Quandary when he collapsed at the side of the trail. Paramedics from Red, White and Blue fire district tried to save Law’s life, but he was pronounced dead at the trailhead. On Sunday, the Rescue Group was called in again to help an injured hiker on a ridgeline between Peaks 2 and 3 on the Ten Mile Trail.